Are you like me who always tend to put off sorting out mails and statements? Who have piles of unopened letters lying all over the house? I have watched countless YouTube videos, read books and blogs on the best way to manage paper clutter and to file away documents. No matter how enticing or convincing it is, it just did not work for me. I am just not motivated to deal with the clutter. It is the same today as it is years ago that I only file my mail and paper about two or three times a year. The process would take me a few hours. 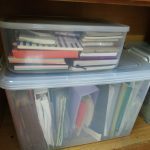 However, I have learned over the years how to manage the paper clutter from going out of control so that I do not get into serious trouble for sorting and filling paper once every few months. It’ll make your life easier! Just by doing this reduced the amount of physical mail that we receive each month, not to mention that it is environmentally friendly. I know many companies would try to use the whole ‘save the trees’ thingy to infuse the guilt in getting paper statement but the bottom line is actually cost cutting. But for me, I am really interested in saving the trees, AND I do not want to waste my time dealing with staggering piles of paper that gets overwhelming. I actually proactively approached my utility companies, cable, bank and credit card companies to opt for e-statement. My telco would send me an sms each month to notify on the charges once the bill is out. If there is nothing out of the ordinary, I do not even bother to check my bill. I do however designate specific email folders to file my bills and statements for tax purposes. Usually we get almost the same letters each month from the same companies/institutions. I do open statements and letters if they look unfamiliar. I would then place the envelopes at a designated bin in my house that I would give to an old lady in my neighborhood for her to sell for money. As for the contents, I would have a clear file where I just shove the letters into them until I have time to deal with them later. So that they are all at one place instead of all over the place- which makes it easier should I get into the mood of sorting and filling. Basically, I also stuff the file with other things like receipts (that I need to keep) and warranty cards. A number of my files, including the family health records are stored inside a cabinet. But…I have an unusual way of keeping these files. I bought some clear storage containers and put all the files inside them. I keep the top of the files labeled so that it is easier for me to see them. As you can see, all these files are irregular in shape and type. Some are plastic folders, some are DVD holders (to store keepsake cards and small bills) and some are actual files. Why did I put my files inside a clear storage cabinet? Reason being is because of my laziness busy schedule, I only do my filling once every few months. I am not sure why, but neglected areas attract bugs. I’ve actually seen death bugs and some unexplained stains on my paper. And you know what, even though it is a closed cabinet, dust and doggy fur can still find their way into the cabinet. After I stuff everything into 2 clear storage containers, I do not need to deal with the dirt and creepy crawlies from making a home amongst the papers (that I would rather throw but still have to keep). If you are doing this, just label everything clearly so it is easy for you to locate the files. If you do not have a cupboard or cabinet to put this, you can stack up the boxes at a corner or in the storeroom. Filling method- to file by subject or period? Recently the Freedom Filer method has gotten very popular as a way of filling paper. Basically the filling system is based on each month instead of individual files. Currently, I am filling my documents by company name, followed by the most recent dated document on top. For warranty cards, I have a designated file to store them and it is on top. The freedom filer method is tempting…. however I find that not all documents are made alike. I need to keep some statements for 7 years for filing purpose whereas warranties varies… some 1 year and some 3 years. By filling by individual company, I am able to purge the documents by huge batches. For example, I have shredded a lot of my older bills by just pulling out by file type. Still, the Freedom filer helps one to instantly file away documents into folders arranged by month in order to work on them later. It requires much less time to sort and pull out individual files to file the document. I would probably give this method a try after I sorted out my current pile of letters and report the findings in future posts.